These recipes are not recipes as such, they are illustrations. 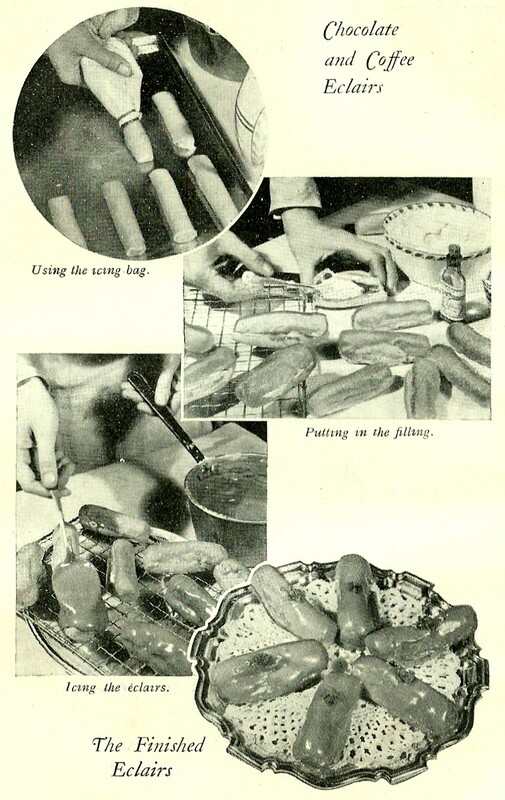 Popular in magazines and newspaper supplements of the forties and fifties they assume a basic knowledge of home cooking in terms of things like choux pastry and meringue. The first is an old favourite of the Sunday ‘special’ tea using fresh cream and jam. 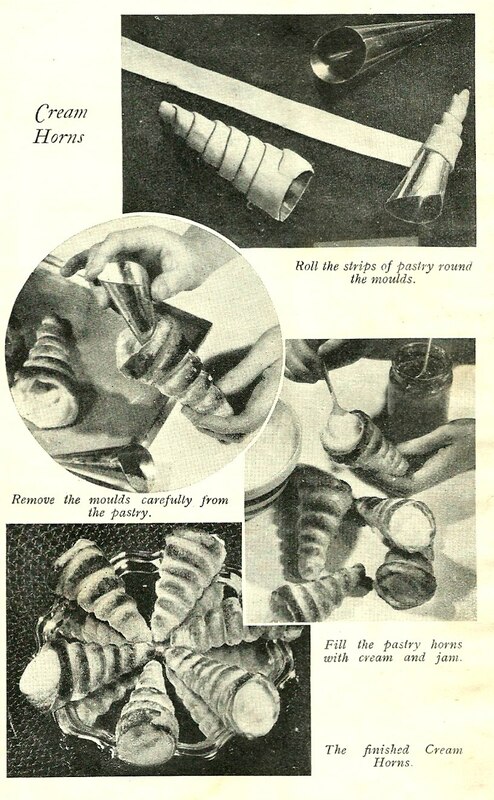 It is still possible to obtain the horn moulds in baking shops and some bigger supermarkets. The second is the Lemon Meringue Pie, again not difficult to make but requiring a certain degree of basic knowledge. Third we have Eclairs, again with that Sunday luxury : whipped cream! 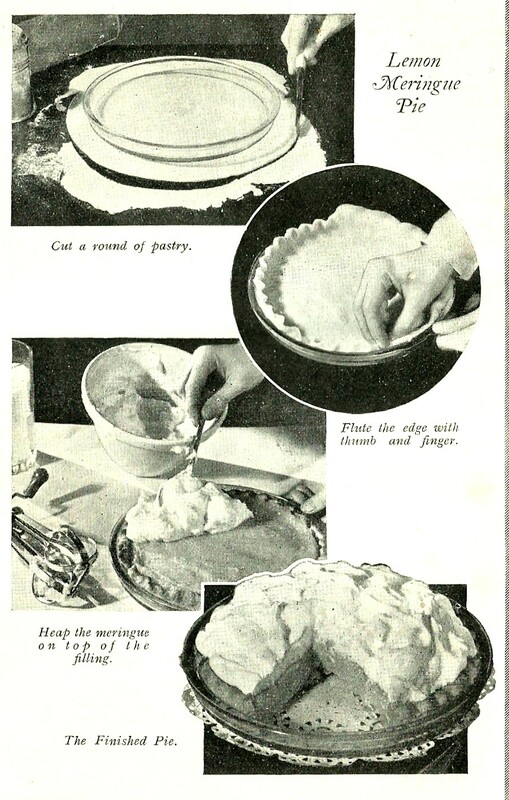 And finally with a slightly higher degree of difficulty, unless you cheat and resort to pre-made Charlotte Fingers and a packet mousse. 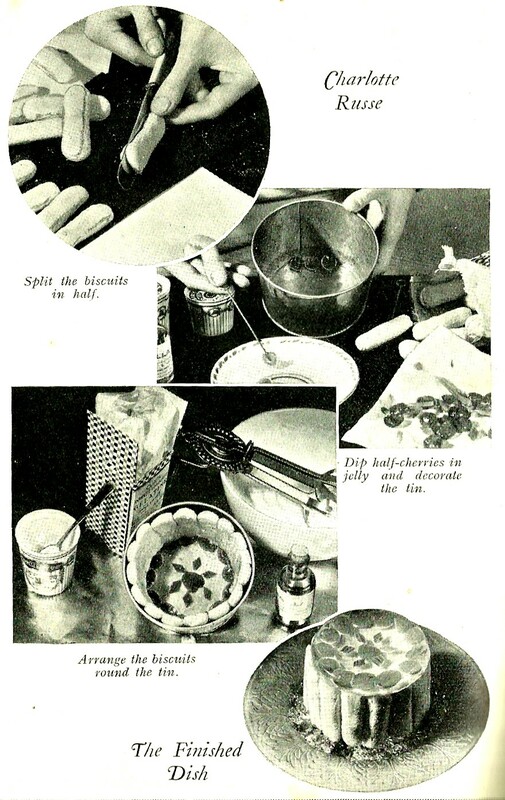 I am currently developing another blog site upon which I shall post only the actual recipes from the archive and link them to the relevant posts here on Granny Robertsons Cookbook. It is currently a ‘work in progress but I hope to start publishing within the next week or so. This entry was posted in Bakery, Pastry and tagged charlotte Russe, cream horns, eclairs, lemon meringue pie, traditional. Bookmark the permalink. That would be fine by me. The image in question is, I believe, out of copyright and therefore available for reproduction in a non-profit format. You may also be interested in the series of blogs I published over Christmas 2012 (just search Christmas) that illustrate a full Tala piping set and an illustration of the results achievable. I hope you may find them interesting. I shall keep an eye out for your blog! Regards, Kevin. PPS: I also have a library of vintage images, if you ever need any at all, although I am sure your library is vast!